Jimmy is the owner of Bulk Landscape Supplies Brisbane, has got his operations running like clockwork. Jimmy has over 30 years of working history in Logistics & Sales Management. Jimmy always wanted to run his own show and now that dream has become a reality and growing by the day. Bulk Landscapes Suppliers are passionate and driven to provide every customer with quality landscaping materials at the best price possible. Jimmy and Team will always ask you questions to ensure the material you order will provide the best possible outcome. Do it Once, and do it Right -Bulk Landscape Supplies. Elaine is Jimmy’s wife and the Office Manager of Bulk Landscape Supplies Brisbane. Elaine also craved the flexibility of working for herself and having time for the children when needed. She comes from a Banking & Broker background and prides herself on completing what she promises and commitment & focus on excellent customer service. She supports Jimmy’s vision and encourages him to achieve his mission & dream. Jimmy & Elaine started their business 9 years ago as a Truck Owner Operator with their first truck. They first started out getting their work from job agencies. While he was doing this Jimmy saw the need for a one-stop shop for Truck Hire and supplying quality material for all sorts of customers from Domestic/Homeowner market to Civil Engineering Companies, Builders, Earthmoving Companies, Electricians, Concreters, Landscapers, Plumbers, Property Developers and many more. Bulk Landscape Supplies Brisbane has steadily grown and now have three trucks. Jimmy is now out of driving the trucks and has his hands on all quoting, sales, logistics & general maintenance. Bulk Landscape Supplies Brisbane have access to many like-minded owner-operated truck drivers and subcontractors for larger jobs. 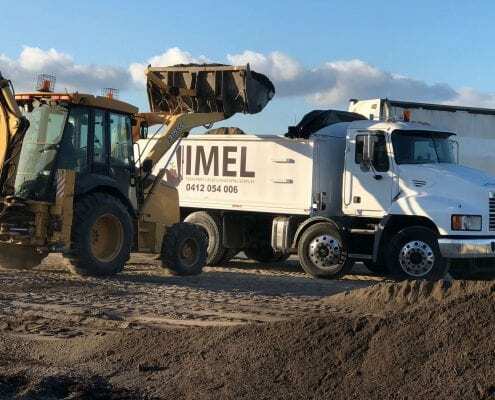 Bulk Landscape Supplies Brisbane travel the greater Brisbane area from the local area of Redlands and the Moreton Bay Islands to North & South of Brisbane. Elaine and Jimmy will take care of all your orders and questions to make sure your next project is done right and on time.